Reclaim the kingdom with TOTAKU Evan, a boy king of the cat tribe who is usurped from his castle. Whether you’re growing your own TOTAKU kingdom or simply a huge of Nin No Kuni, the TOTAKU Evan is the perfect addition. The highly detailed figurines stand at 10cm tall and make a great addition for any gamer! Don’t miss out and shop TOTAKU Evan today. TOTAKU Evan is based around the protagonist from Ni No Kuni. After his father died Evan became King but didn’t survive the coup and now he must reclaim his lost kingdom. Instead, he creates his own kingdom as he sets off on a quest to seek revenge and bring peace to the kingdoms. Ni No Kuni is a role-playing game which has become a hit with fans all over the world for its charming storyline and incredible cast of characters. Each of the TOTAKU figures are 10cm tall and highly detailed. 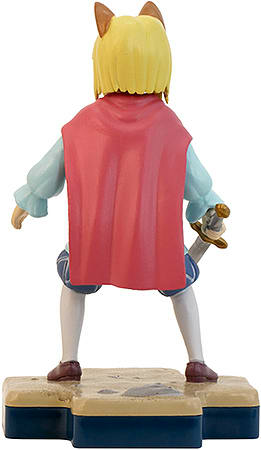 The unique cross-shaped base offers a sturdy and durable fixed base which the characters stand on. Give your TOTAKU Evan personality with many ways to display the figurine! Shop the charming TOTAKU Evan and pay homage to the popular game.